Drew Jasper ’19 dribbles the ball in a game against Waldorf at Beach Chalet. The Knights are in action today against International at 4 p.m.
Stuart Hall soccer is on a roll with a five-game winning streak putting them at a 9-0-1 record this season, as of time of press. The Knights’ most recent win came against Bay High School on Sept. 20, which ended with a final score of 3-0. Pescadero and Waldorf, the two teams to fall to the Knights before the win over Bay, were both destroyed by Stuart Hall. The Knights’ blew-out Pescadero 8-0 on Sept. 18, which was preceded by the 11-0 destruction of SF Waldorf School on Sep. 15. “We’ve put in the time and effort to get to where we are now, and we know that as long as we keep working hard, this team will be successful,” varsity player Drew Jasper ’19 said. 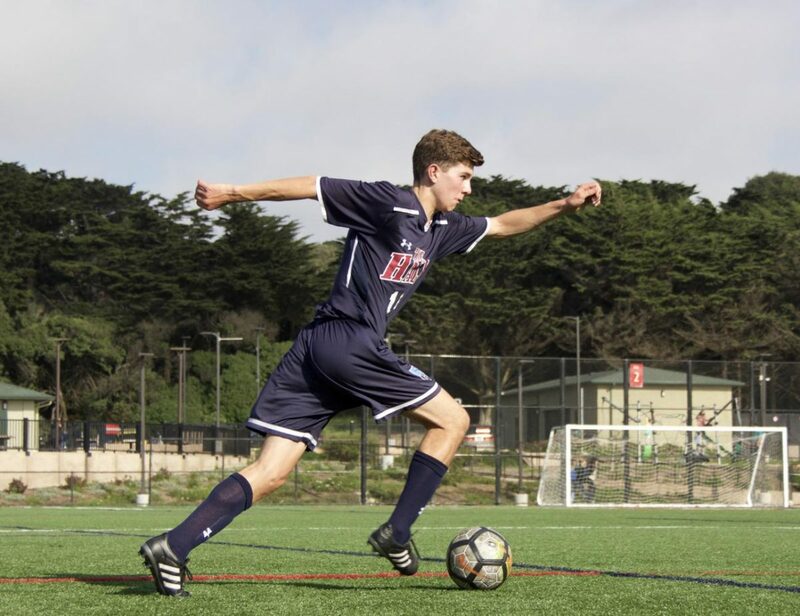 The team beat Jewish Community High School 3-1 on Sep. 11, launching it into its current winning streak after the 1-1 tie against Urban that put an end to Stuart Hall’s previous four-game winning spree. The Knights kicked off the season on Aug. 23 when they beat Roseland University Prep of Santa Rosa in a close match, 1-0. Stuart Hall continued to tear up competition as the team went on a four-game winning streak. While upperclassmen captains Angel “Cheese” Padilla ’18 and Cyrus Bernier ’19 play major roles in leading the team to success, freshman Drew Eislund has surprised teammates and fans with his skill and effort. Based off of the 9-0-1 record, the efforts between veteran players and strong freshmen seems to be just the right combination, as Stuart Hall hopes to take the league title this year. “We are going to destroy the competition and win it all,” Juan Grafendorfer ’19 said.